Final La Jara Farmers Market for this Season! Rhonda Mouser, singer, songwriter and guitarist will perform this Friday in La Jara at the Farmers Market – 4-6:00 PM.This gifted songwriter weaves music from stories of the mundane, the daily grind, love, loss and about the magnificence of life she experiences around her. Rhonda lives in an off-grid cabin right here in the San Luis Valley—she’s one of us! We are so proud to host this accomplished performer. You’ll love what you’ll listen to. Come this Friday to the Farmers Market ‘stage’, at La Jara Town Hall. What most ‘La Jarans’ recognize is the choice selection of locally grown produce offered by producers at the market. Everything is fresh and this is the last Friday you can walk downtown for the tastiest fruits and vegetables. This last week of the market bring along the children and your longing for a sweet treat! Sylvia Montano will be on hand serving chocolate-dipped Ice Cream and delicious fresh fruit popsicles. Beyond mouth-watering treats, you’ll find wonderful crafts to choose from – think Christmas and upcoming birthdays! La Jara’s own June McDaniel brings her own uniquely created quilts, jewelry and original paintings she’s made of our surrounding mountains. You’ll be eating healthier, and farmers appreciate that you support their hard work. Farmers markets, right in your own community, support the local economy and help you “keep green”. It’s a winning situation for everyone! There’s so much for which to be proud and grateful in the town of La Jara. Visit the Framers Market and show your appreciation of La Jara businesses and the town who have made this summer market program possible. La Jara is the small town where community spirit abounds! Come join us for this final farmers market, Friday, September 7th from 3-7pm. The market is located in downtown La Jara at the park by the Town Hall. You’ll enjoy meeting good friends and neighbors who appreciate the fun, great musical performances; fine local produce of the valley and incredibly beautiful crafts that the La Jara Farmers Market brings each summer. That’s 3-7:00 PM at La Jara Town Hall on Friday. Visit the market this Friday when the artful and creative Paul Guzman, with his band, Lucid Frequency will perform between 4:00 and 6:00 PM at the park at La Jara Town Hall. Paul blends his guitar with his own original and unique electronics to create a memorable time while you shop from vendors who bring the freshest local produce almost to your doorstep. Several grant programs encourage healthful eating and produce purchases at the La Jara Farmers Market. Each week the Healthy Habits Group continues their colorful and free cooking demonstrations at their mobile kitchen with inspiring recipes and samples made from local produce. This educational program is funded by Colorado State University Cooperative Extension. The Healthy Habits booth welcomes and redeems produce vouchers for 267 WIC families and 134 senior citizens. Vouchers may be redeemed at all produce vendors. Come join us for this week’s market, Friday August 24th from 3-7pm. The market is located in downtown La Jara by the Town Hall. With just two markets remaining after this Friday you’ll enjoy meeting good friends and neighbors who appreciate the fun and fine food the La Jara Farmers Market brings each summer. For more information, or to become a vendor, Phone James or VGail at 719-589-6374. Buy Fresh! Buy Local! at the La Jara Farmers Market. At this time during the 2012 summer, the fresh vegetables are at their very best. There were boxes of organic peaches ready for canning or just munching on the spot. Most vendors bring organic produce grown on their small farms and from local gardens. There are also fresh baked goods from local certified home kitchens. Homemakers have successfully completed the new Colorado Food Act classes to turn their kitchens and their talents into the pick of the market! VGail Vonderweidt, La Jara’s 2012 Farmer’s Market Site Manager, brought her artistic talents to this past week’s farmers market decorating faces with festive colors that last for days or wash off easily. 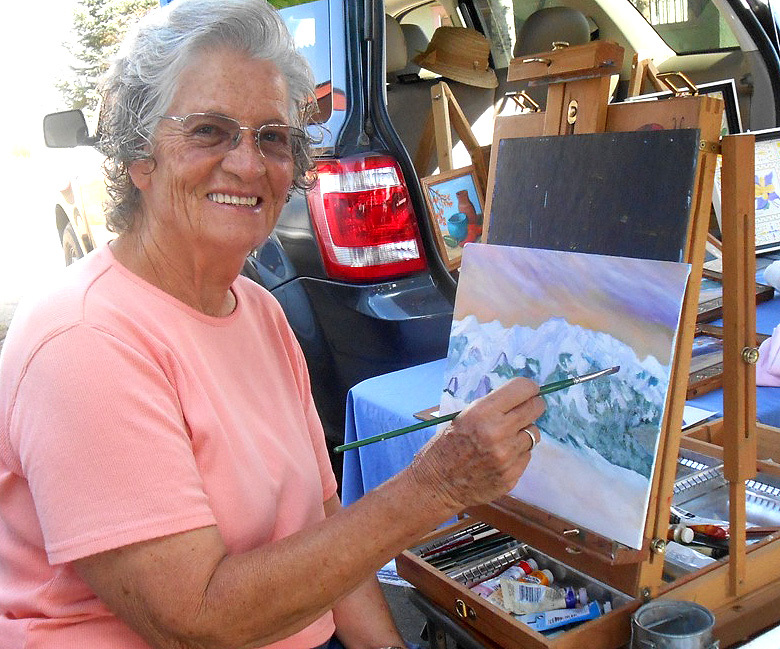 If the La Jara Farmers Market were the best kept secret in the San Luis Valley then this summer’s seven-week market program wouldn’t be quite this much fun. Come to La Jara’s Town Hall for fresh fruits and vegetables, for up-to-date activities and information happening in the Valley from the Conejos County Chamber of Commerce. Come for the free taste treats from the Healthy Habits MOKI table, and come for the great music presented each week. And, this wonderful Friday afternoon and evening market program in La Jara has been made possible by the support of Little Flickers of Capulin, Joe Valdez of La Jara Pharmacy, the Conejos County Chamber of Commerce, Circle K Mills, everyone from Cactus Hill Ag Consulting in Capulin and the town of La Jara. This past Friday, Rose Viapando and Solomon Lopez, Las Cancioneros Del Valle, local singing favorites, brought magical musical sounds to the market. This Friday, Joshua Wohlrabe of Adams State University Music Department will bring his collection of drums from all parts of the globe for an exciting drum circle. The market will throb with the rhythms from around the world as everyone … yes, children too … is invited to pick up a drum and the join in the circle of fun. If you haven’t sat in on a drum circle then Friday will be your chance to experience the fun and Joshua makes it so easy by showing you how. The market runs from 3:00 through 7:00 PM at the La Jara Town Hall. So, comejoin us for this week’s market, Friday August 10th from 3-7pm. The La Jara Farmers Market is conveniently located right in downtown La Jara on Broadway Avenue by the Town Hall. And, you’ll find this best kept Valley secret opens every Friday afternoon and evening through the 7th of September. New vendors are welcomed and more information can be had by phoning VGail or James at 719-589-6374. The first La Jara Farmers Market this past Friday afternoon and evening got off to a great start with Donald Garcia entertaining everyone with his musical talents. There were many San Luis Valley vendors selling fresh fruits and vegetables, and beautiful locally made handcrafts! If you haven’t made it to the La Jara Farmers Market yet, be sure to mark your calendar for this Friday afternoon and evening—that’s 3:00 to 7:00 PM. The Farmers Market is located at the park by the La Jara Town Hall. The Town Hall Park is a perfect central location for market vendors and shoppers alike. There’s plenty of parking and it’s just a short walking distance to in-town businesses. This Friday, Rose Viapando and Solomon Lopez of Las Cancioneros Del Valle will be performing at the market starting at 4:00 PM. Be sure to be on hand to enjoy their Spanish and Gospel favorites. In the upcoming weeks there will be other exciting performers. This season Lowdead Zaragoza and the Atomic Pork bands will bring lively entertainment to the La Jara Farmers Market. Later throughout the summer season, Paul Guzman, a new entertainer to the San Luis Valley from California, Kate Mann from New Mexico and Rhonda Mouser have promised to join the line-up of exciting musical performers. The La Jara Market runs from 3:00 to 7:00 PM every Friday until the 7th of September. Don’t forget the market is conveniently located in downtown La Jara by the La Jara Town Hall. Come out and enjoy meeting your friends and neighbors and support your local community producers at the La Jara Farmers Market! For more information, or to become a vendor, you can call James Bird and VGail Vonderweidt at 589-6374. Buy Fresh! Buy Local! at the La Jara Farmers Market.